The Ghost Town Trail totals 36 miles in Indiana and Cambria Counties, Pennsylvania. The trail was originally established in 1991 when the Kovalchick Salvage Company donated 16 miles of the former Ebensburg & Black Lick Railroad to Indiana County. In 1993 the Cambria & Indiana Railroad donated an additional 4 miles from Rexis to White Mill Station known as the Rexis Branch. In 2005 an additional 20 miles were added to the trail - 12 miles in Indiana County and 8 miles in Cambria County. The trail is designated as a National Recreation Trail by the U.S. Department of the Interior. 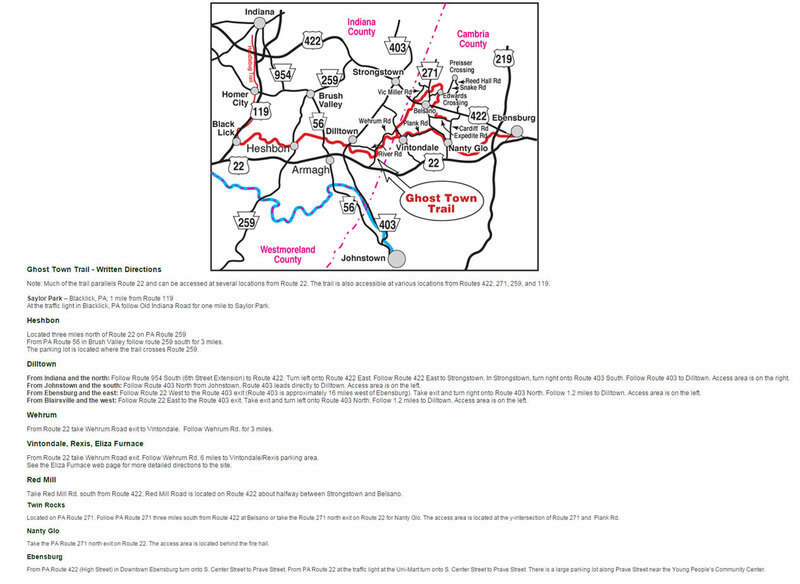 Detailed trail maps in PDF format are available for all three connected trail sections, Blacklick to Dilltown, Dilltown to Nanty Glo, and Nanty Glo to Ebensburg. A new map is also available for the C&I Extension. These are large files which may take several moments to download. A regional trail map and a handy Ghost Town Trail Mileage Chart, a combined is also available Ghost Town Trail Combined Map. The Ghost Town Trail is also part of a large network of trails in western Pennsylvania known as the Trans Allegheny Trails network. 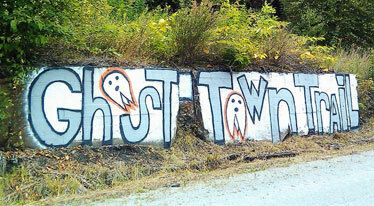 Be sure to check out our special Ghost Town Trail Interactive Flipbook. It features some interesting information and advice for tackling the trail! In 2009 the Rails to Trails Conservancy conducted a survey of the users of the Ghost Town Trail. The results of this survey can be found here in two forms (both as downloadable PDFs): The Complete User Survey Report and the Executive Summary of the report. If you are mobility disabled and would like to use an electric mobility device on our trails please read our mobility device guidelines before you visit.